And yes, my recycled craft mania continues. 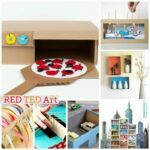 Earlier this month I shared 25 of Red Ted Art’s favourite recycled crafts, we revisited the 40 cardboard box crafts ideas round up and now, I wanted to take the opportunity to share some from “around” the web. 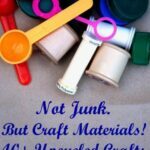 – which is what the “Get Crafty” round ups where originally all about. So. 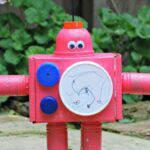 With the New Year upon us, and the excesses of Christmas behind us, let’s look at every day items around us and see what we can recycle – be it kids recycled crafts or recycled crafts for adults! 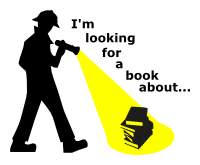 This is again part of the fabulous Playing By The Book’s “I am looking for a book on” series – the them being “Green/ Recycling” issues. 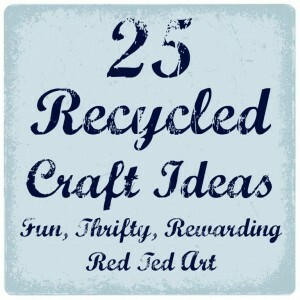 So if being greener is something that is on your mind for 2013, do pop over for some inspirational Green Kid#’s Books Ideas and read on for some recycled craft ideas! This is the sort of craft I would love to make “one day”… you need to be at right place at the right time – i.e. have or spot an old side table or chest of drawers and then get crafty. 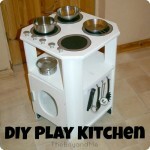 The Boy And Me shares what they did to make this wonderful recycled kitchen! When I first saw this I thought it was simply genius!!! 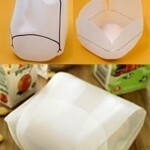 Such a fun and clever way to use egg cartons. 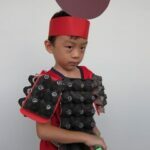 I can’t wait for the relevant fancy dress party or school play to make this for my kids. Green Issues shares this wonderful costume idea. Another simply super clever idea – from El Mundo De Reciclaje nevermind the sandwiches.. this would be great to store my crafty bits and pieces too! 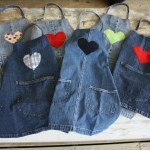 And I love these denim aprons from Happy Hooligans. Not just because of the cute hearts, but because these are versatile and sturdy aprons that the kids can use cooking or painting or “whatever”. 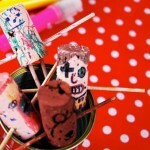 Perfect for a day of mess and fun and a great kids recycled craft to boot! 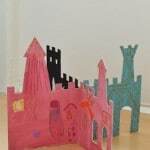 I love Lila A, she has beautifully whimsical kids recycled crafts – and this cardboard castle is no exception – easy to make, great to store and hours and hours of fun. I need to make one. Quick! 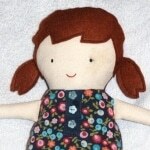 One of our own crafts the Black Apple Rag Doll, from a pattern from Martha Stewarts website. I have made about for of these now, as well as some teddy versions. 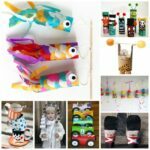 They make great gifts and can be made as “keepsakes”, by using your child’s old clothes. 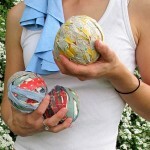 I have had my eye on these rag juggling balls for a while.. and I just realised – all those old ahem, underpants, and socks that The Englishman was throwing out would make for great “centres”, then use some pretty fabric scraps around the outside?! Full tutorial on Maya Made. 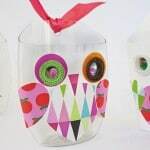 Swedisch Website Pysselbolaget made these totally adorable recycled Owls from old bottles. Don’t they look fantastic. 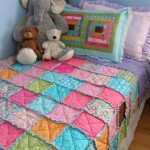 I don’t know if I have the patience to sew one these WONDERFUL Rag Quilts from Imperfect Home Making, but I wish I could. I think it is beautiful and a quilt made from old bits and pieces could have such personal meaning. It looks gorgeous and comfy. Wonderful. Dutch Website MUS has made some totally adorable cork people (well, adorable in a scary way of course). 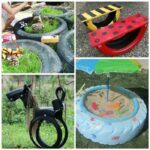 I love that these are so child friendly and the kids where given free reign to create! I LOVE the lights. 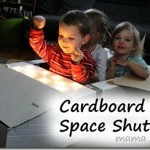 I know my kids are pretty happy pretending that a cardboard box is a space shuttle.. but shape the box a little, add these fabulous lights and your home made shuttle is beyond cool. A little imagination takes you so far!! Check out Mama Smiles for all the details. 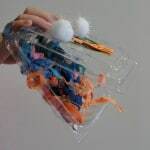 Another wonderfully child led activity are these monsters made from fruit packaging over at Kitchen Counter Chronicles. Looks like lots of puppetry fun! I love the idea of using old plastic bottles as planters. And look at this fun character that Coffee Cups and Crayons made brilliant. 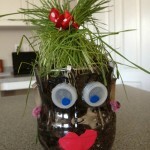 We do LOVE grass heads. Don’t throw away old magazines.. but Get Arty. Magazines are a firm favourite in art classes for collages. Very inexpensive and fun art indeed. 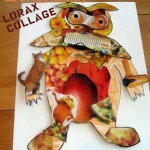 Check out this cute lorax by JDaniel4s Mom! I love the title of this post by My Make Do and Mend Year – “The Best Christmas Present Ever” – yes the humble box… we already know that I love box crafts, so of course I will adore this fire engine. It is 100% perfect. And I know my kids would adore playing in this too…. mmmh… goes off to find a box! What I like about THIS pirate ship, is that a) it shows the creativity and imagination of children and b) that kids simply love to build! Wonderful. Mummy Mummy Mum and her kids tells us more! 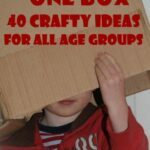 What a great way to reuse a great big box – make a small world for your child to safely sit in (and contain the mess) whilst having lots of fun! This idea is from The Imagination tree of course! And here is an adorable egg carton box and kitchen towel roll craft from Rainy Day Mum: 5 little speckle frogs. Awe. How cute are they? And lots of nursery rhyme fun too! Lots of inspiration here Maggy, and I’ll enjoy going through to your post from earlier in the month too. Thanks so much for linking up again. Fab post! Thanks for linking up! Thanks for a great round up! We’re so pleased to be a part of it! Thank you for organising me again Zoe! 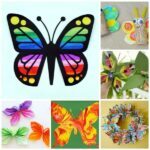 And lovely crafts everyone, great to have you part of this feature! Oooh! Pinning this! Great round up! 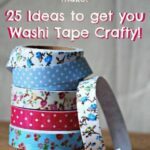 So many awesome ideas! Thanks for including my daughter’s planter–she’ll be thrilled when she gets home from school! Oh lovely and thank you! My pleasure, loved it from the day I first saw it! 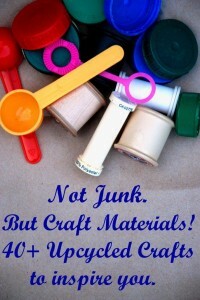 Many of my favorites are here and I love recycled crafts, art and play. We are always using recycled materials. In addition to this process helping with saving money and resources, I find that it also fosters creativity and imagination. What fab ideas. Favourite is the A-Z bottle tops. Oh great round of ideas! Thank you so much for featuring me! I’m very proud of my little kitchen.